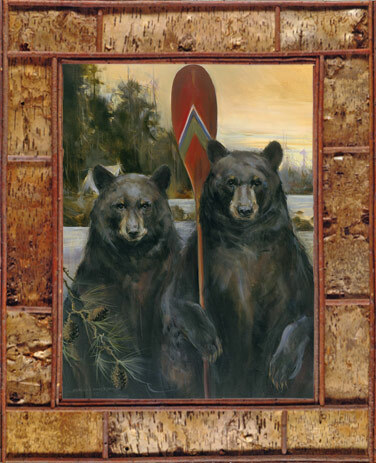 Measures approximately 40" x 30"
Two bears in the woods holding a paddle and in a classic pose. American Rustic by artist Marilynn Dwyer Mason. You can own a high quality 40" x 30" reproduction on artist canvas stretched on wooden stretcher bars. This is a limited edition of only 500 prints. Includes rustic birch bark frame. 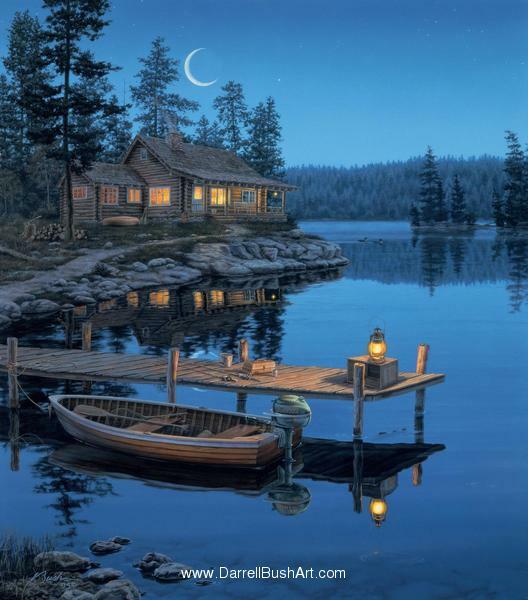 High quality giclee canvas print created with archival inks on real artist canvas. 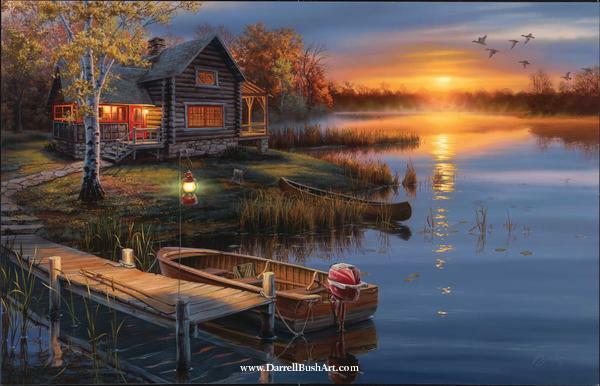 Autumn at the Lake - by Darrel Bush. Limited edition lithograph of 1250 prints. Shipping Size: Medium. 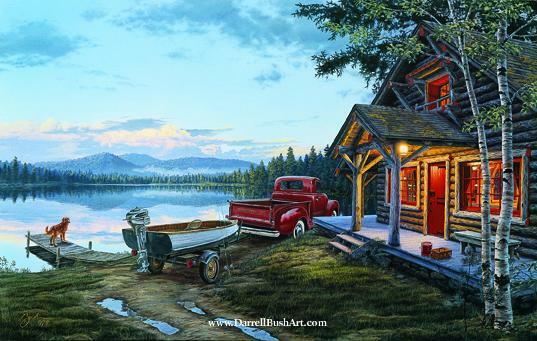 Measures 17" x 27"
Darrell Bush is best known for his wilderness art and was named among America's 12 most popular artist by four different national art publications. 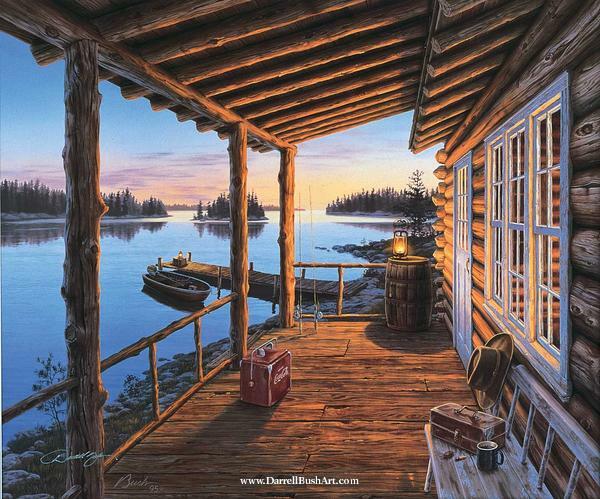 Darrell's art has also been featured recently on the cover of Cabela's Outfitters catalogs. 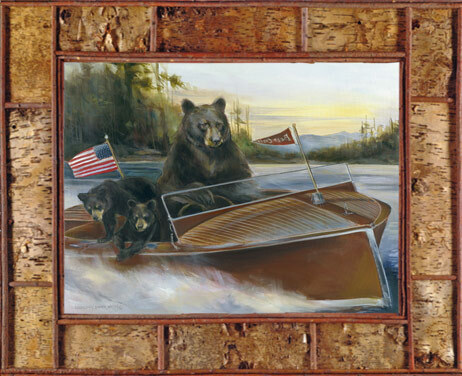 Bears on a wooden speed boat in Bear Craft, from original painting by Marilynn Dwyer Mason. You can own a high quality 40" x 30" reproduction on artist canvas stretched on wooden stretcher bars. This is a limited edition of only 500 prints. Includes rustic birch bark frame. 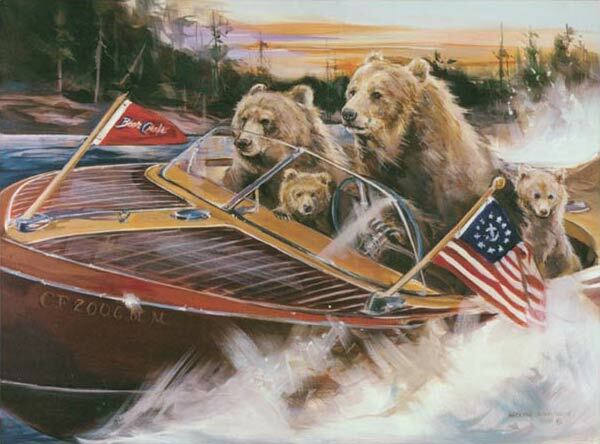 High quality giclee canvas print created with archival inks on real artist canvas. 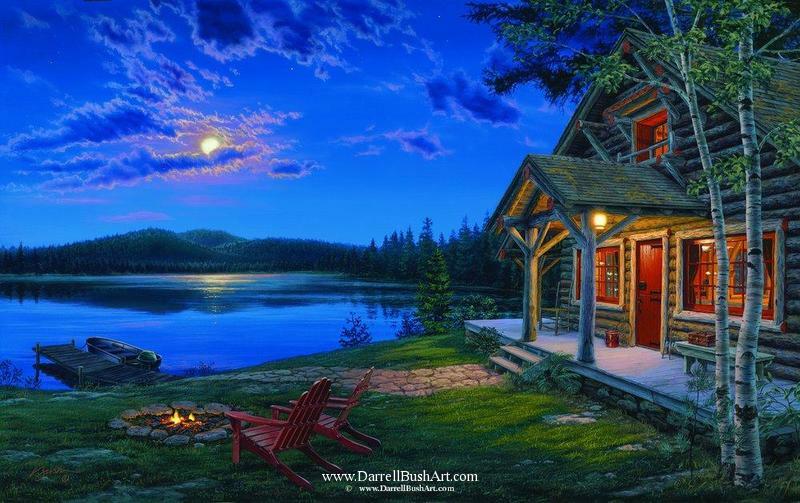 Cabin Fever - by Darrel Bush. Limited canvas edition of 195. 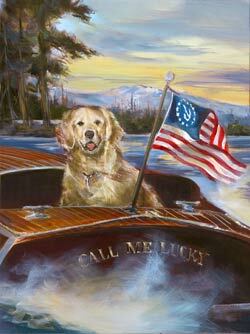 Beautiful Golden Retriever riding in a wooden speed boat, from original painting Call Me Lucky by Marilynn Dwyer Mason. You can own a high quality 40" x 30" reproduction on artist canvas stretched on wooden stretcher bars. This is a limited edition of only 500 prints. 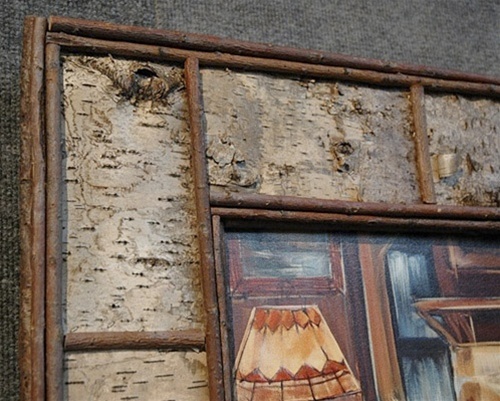 Includes rustic birch bark frame. High quality giclee canvas print created with archival inks on real artist canvas. Crescent Moon Bay - by Darrel Bush. Limited edition lithograph of 999. Shipping Size: Medium. 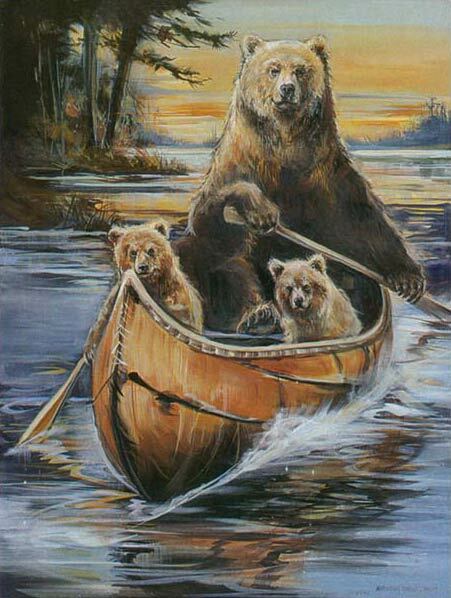 Measures 20" x 23"
Bears paddling a canoe up a river, from original painting Homeward Bound by Marilynn Dwyer Mason. 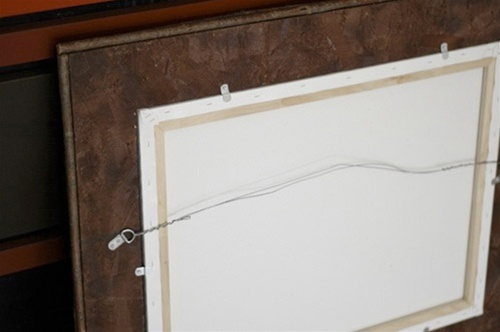 You can own a high quality 40" x 30" reproduction on artist canvas stretched on wooden stretcher bars. This is a limited edition of only 500 prints. Includes rustic birch bark frame. 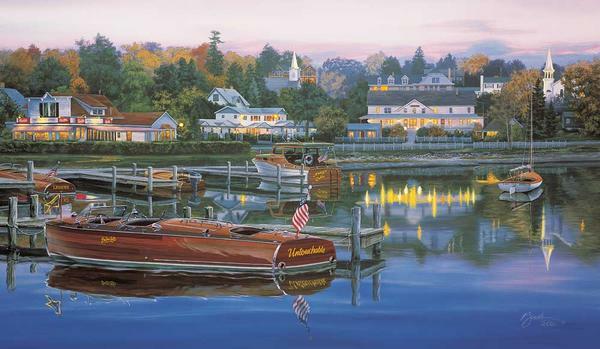 High quality giclee canvas print created with archival inks on real artist canvas. In the Wake of a Legend - by Darrel Bush. Limited edition canvas. Shipping Size: Medium. 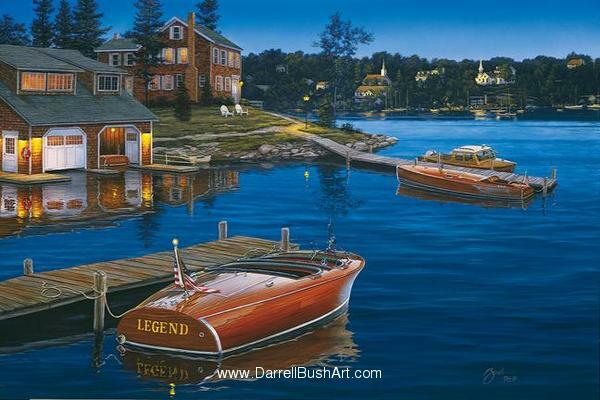 Measures 15" x 30"
Legends at Bay - by Darrel Bush. Limited edition canvas.. Shipping Size: Medium. 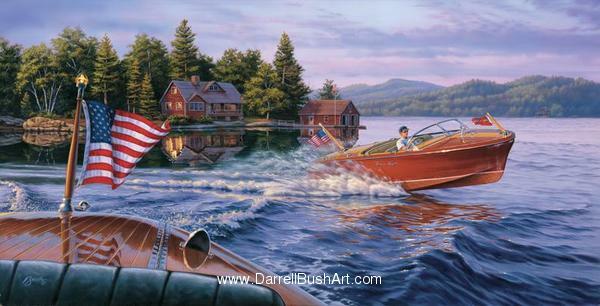 Measures 17.5" x 26.5"
Legends of the Lake - by Darrel Bush. Limited canvas edition of 195, serial numbered. Opening Day - by Darrel Bush. Limited canvas edition of 195. Shipping Size: Medium. 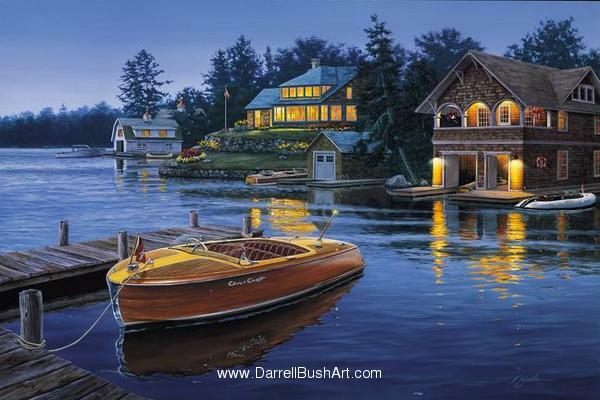 Measures 20" x 24"
Silent Shores - by Darrel Bush. Limited edition of 1,250 prints. Shipping Size: Medium. 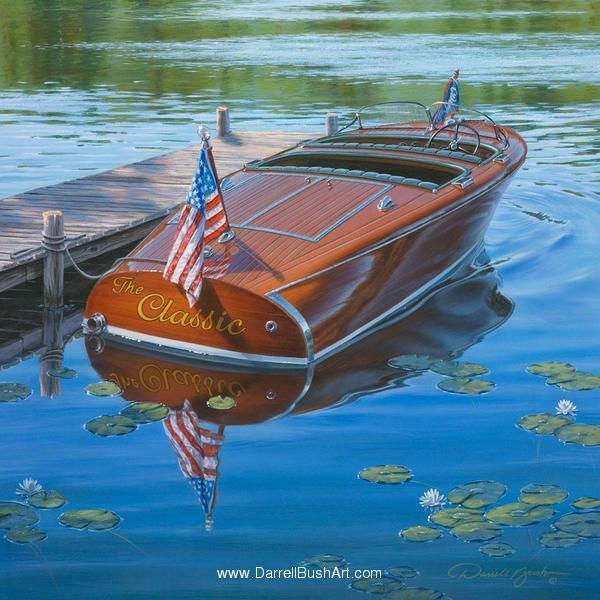 Measures 16" x 27"
The Classic - by Darrel Bush. Limited edition canvas giclee. Shipping Size: Medium. 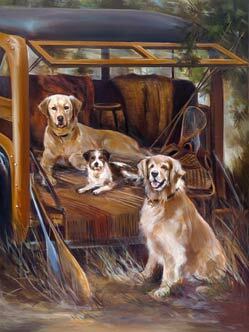 Measures 18" x 18"
Dogs relaxing in the woods, from original painting The Country Life by Marilynn Dwyer Mason. You can own a high quality 30" x 40" reproduction on artist canvas stretched on wooden stretcher bars. This is a limited edition of only 500 prints. Includes rustic birch bark frame. High quality giclee canvas print created with archival inks on real artist canvas. Measures approximately 30" x 40"
The Legend Lives On - by Darrel Bush. Limited edition canvas. Shipping Size: Medium. 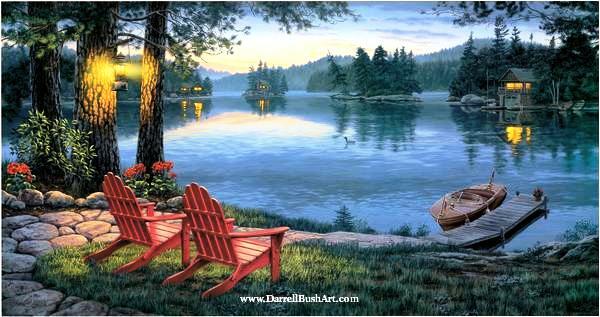 Measures 17" x 28"
The Perfect Getaway - by Darrel Bush. Limited edition lithograph of 500. 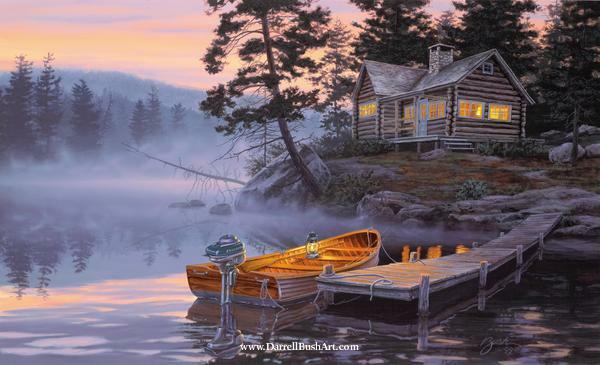 Twilight's Calm - by Darrel Bush. Limited edition of 600 prints. 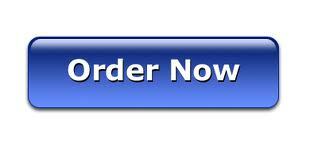 Shipping Size: Medium. Measures 15.5" x 29"